Educators are looking for new ways to teach students who for a variety of reasons cannot participate in a traditional classroom. Students want to attend institutions where they can actually participate in conversations and lectures instead of just watching them on video. International organizations know that online learning makes it possible for students from different countries and continents to work together, but they often struggle with poor network conditions. With LiveSwitch, educators are able to add chat and multiparty audio/video conferencing to their current online systems, upgrading them to make use of modern technology. Using a mixing server, audio and video from a number of students can be mixed into one stream. This provides a low bandwidth solution that can be used when networks are poor, or when devices such as iPads and iPhones are used which cannot handle more than three or four connections at once. This chart is an example of how LiveSwitch could be used in an education application. WebRTC signaling is used to control and monitor conversations. LiveSwitch runs as a peer on each of the clients, while each client peer also has a matching “headless peer” that runs on the server. The headless peer does the decryption and decoding and passes the result to an MCU which combines the streams into one and passes the combined stream back to the “headless peers” for re-transmission to the client peers. If desired, a recording server could be added to record all or some of the interactions using LiveSwitch's unique capabilities in Selective Forwarding. LiveSwitch includes all the power of multiparty WebRTC media streaming and signaling in one complete package, ideal for server-based real-time applications. 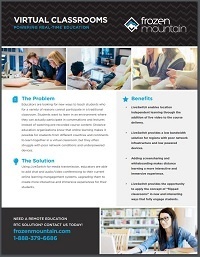 Companies worldwide rely on Frozen Mountain to develop their remote education solutions and products. Contact us to see how you can also use Frozen Mountain's RTC products and services to be at the forefront of education delivery.